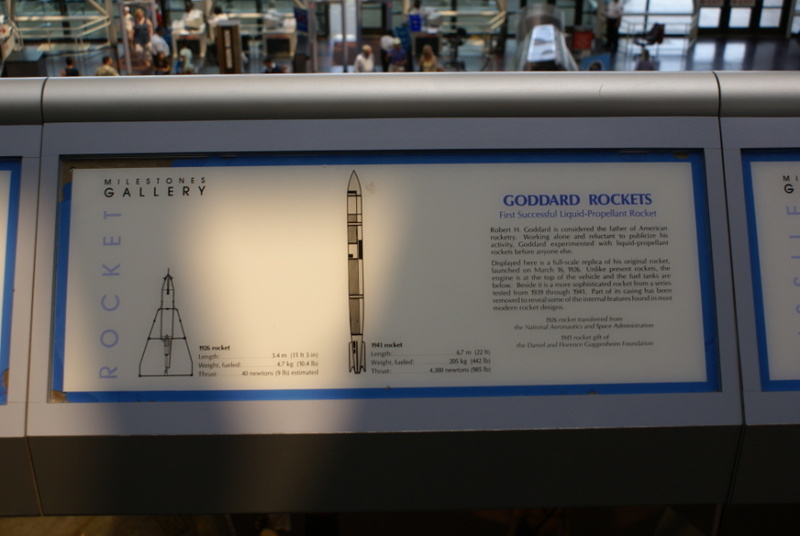 Robert H. Goddard is considered the father of American rocketry. Working alone and reluctant to publicize his activity, Goddard experimented with liquid-propellant rockets before anyone else. Displayed here is a full-scale replica of his original rocket, launched on March 16, 1926. Unlike present rockets, the engine is at the top of the vehicle and fuel tanks are below. Beside it is a more sophisticated rocket from a series tested from 1939 through 1941. Part of its casing has been removed to reveal some of the internal features found in most modern rocket designs. The 1926 rocket is NASM catalog #A19761803000 and the 1941 rocket is #A19850177000.